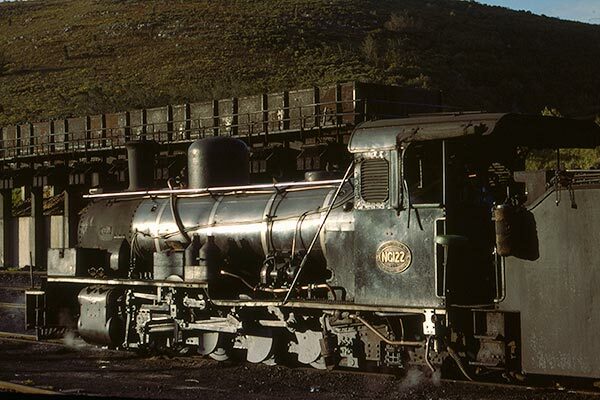 Caption - South African Railways (SAR) NGG15 class 2-8-2 NG122 stands by the coal stage at Assegaaibosch loco shed in October 1979. At this time steam was used at the western end of the two-foot gauge line from Port Elizabeth. During the apple harvest this line was extremely busy with double-heading a common feature on trains heading downhill to the coast. Built in 1949 by Societe Franco-Belge in Belgium, NG122 is now preserved at the Outeniqua Transport Museum, George, Western Cape.